Java is a computer programming language is developed and released by James Gosling of Sun Microsystems in 1995. It is concurrent, class-based, object-oriented which produces software for multiple platforms. Java is used everywhere such as game consoles to supercomputers, laptops, data centers, and from mobiles to the internet. 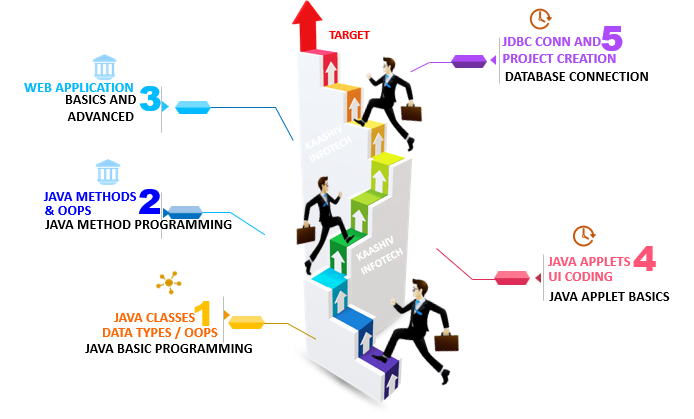 Why KaaShiv InfoTech Company to learn Java Training in Chennai? Kaashiv provides Best Java Training in Chennai with professional trainers who provide real-time training and also projects to the candidates for better understanding. Why Students Enroll for real time Java Training in Chennai ? Java is the Object Oriented Programming Language (OOPS) that produces software for multiple platforms. Java was originally developed by James Gosling of Sun Microsystems. It is the most popular programming language for Android smartphone. Excellent multi-functional IDEs and so on. Learn and Implement 120 Concepts Covering Java Basics to Advanced. Students undergone Java training will be expertise in Java Basics and Advanced, Applet Programming, Java Servlet page, Mysql Programming and Java Project. For Java Training 120 concepts from Basic to Advanced will be covered.